Good morning! I hope you are having a fun Finish it Friday! I am- and I am even getting a head start on Christmas projects! I love Christmas, but there is always so much I want to do between the Friday after Thanksgiving (when we put up our tree and lights) and Christmas Day. I have learned to scale back and let some projects ‘go’ if I start feeling overwhelmed, but part of me still wants to do it all!! Some years, in an effort to enjoy the season more and not be overwhelmed, I have only given 1 homemade Christmas gift, not mailed cards or made less candy. Once, I tried to only give homemade presents that were finished before Thanksgiving- but no one received any. This year, I am trying to get a few, fun Christmas projects done before Thanksgiving. This is a hard task for me- it is difficult to paint, sew, or even think of red/green anything when it is 90 degrees outside! Thankfully, today is a beautiful 74 degrees, and I have a Christmas Finish it Friday project to encourage (maybe push) me. Last month, I made Christmas shaving cream gift tags and it sparked some fun preschool memories in my family: Bubble prints! A bubble print is a fun project we did when I taught preschool, many years ago. 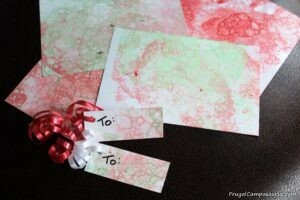 I also made Christmas Bubble print gift tags with my kids at home. 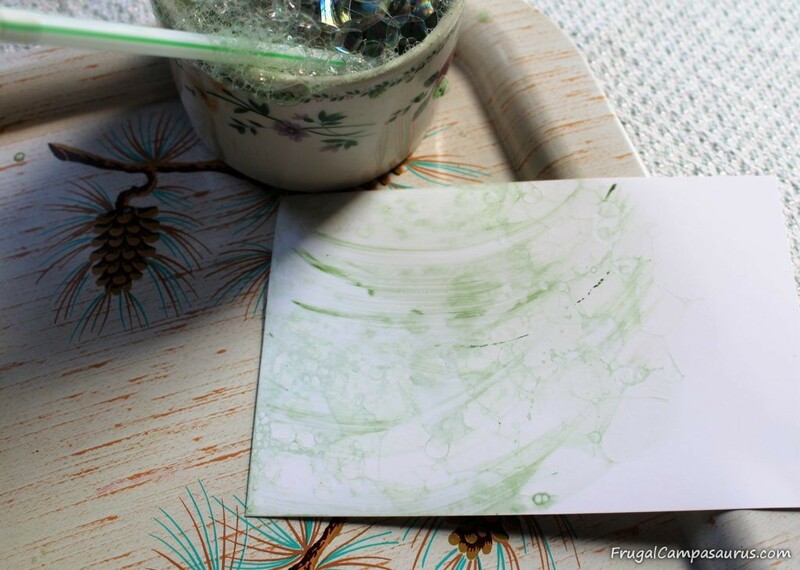 It is extremely easy, frugal, fun and messy! 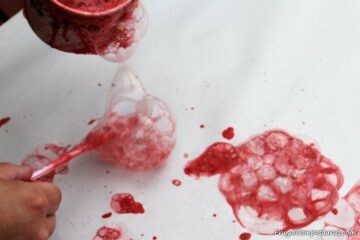 Supplies: this is for 1 color; it is a small amount of liquid, but makes a lot of bubbles! paper of choice to print on– I had extra photo card stock to use, I have used index cards, poster paper, typing paper, envelopes…….I also used a $2 end roll of newsprint for the wrapping paper, it is from a local newspaper printer and I love it! 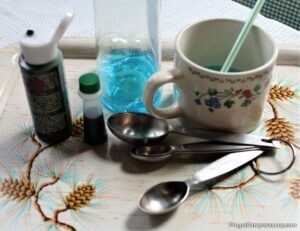 Mix ingredients together in the cup or dish. 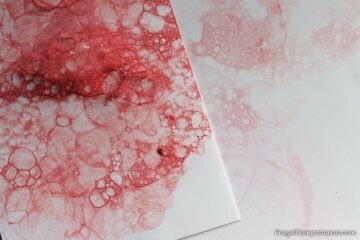 I like the paint; it makes a thicker liquid with stronger colors of printed bubbles. Food coloring is fine, if that is what you have on hand, though the green was more lime colored and the red turned out pink. Putting in more food coloring or less water may help get a stronger color. 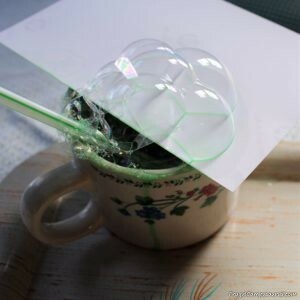 I had to tilt the cup to use straw when I made the bubbles because there was not much liquid in the cup. I could have doubled the recipe, but it made lots of bubble, enough for 10 foot of wrapping paper plus 5 pieces of photo stock and I still dumped a lot of the mixture down the drain! If young children are helping, have them practice blowing out with the straw. They should feel it come out of the straw end on their hand- or your hair or at a sibling…….Also remind them often to blow out as they are working- even a little bit of the soapy water can upset the little tummies and make their faces turn green, something that is nice to avoid-especially at school. Please hover over pictures for more directions and comments. two choices of colorGoing to try paint and food coloring, love choices! mixed colors of paintI like the combined colors! 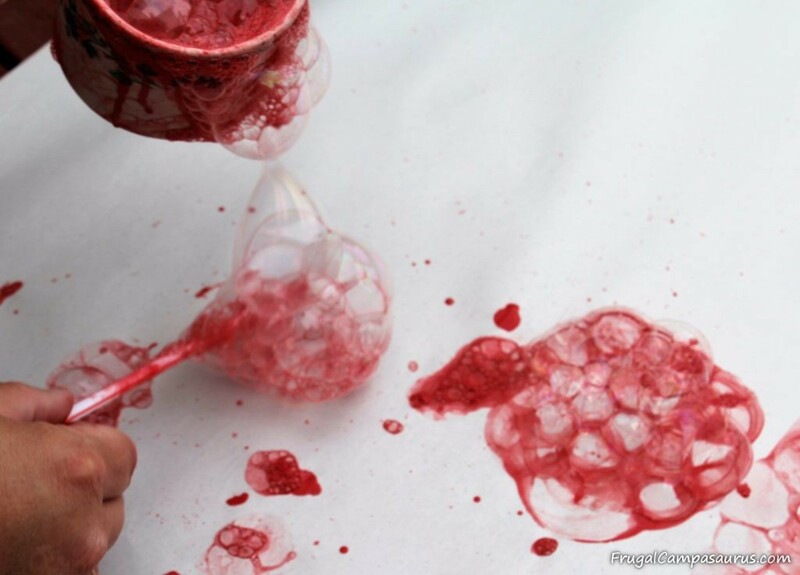 bubbles and strawWorks great to blow a few bubbles and then move with a spoon! outside wrapping paperDefinitely a messy, outside project, though pick a non-windy day! red bubbles and strawLove the bubble design! finished wrapping paperFinished wrapping paper- so much fun! And done way before Christmas! christmas tags doneFinished paper and gift tags- turned out nice! It is a fun, messy project. 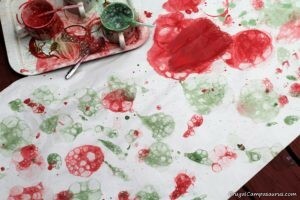 The paint and especially the food coloring can stain, so I always wear paint clothes and cover everything. Maybe my camera needs paint clothes, or a plastic bag, somehow I got paint on the lens! Thankfully, the youngest noticed and we got it cleaned right away! I did the smaller projects on a tray and the wrapping paper was done outside. Try to pick a calm day to work outside. There was a small breeze today and the bubbles were blowing away! Of course, that could be fun too, if the kids had paint clothes on and tried to catch the colored bubbles with paper? Maybe something to try next year with the grandbaby! 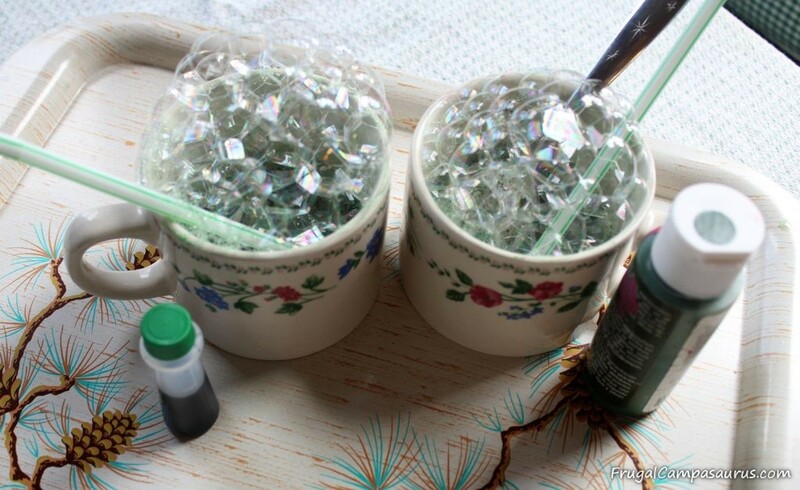 Basically, you just blow bubbles and press the paper onto them. 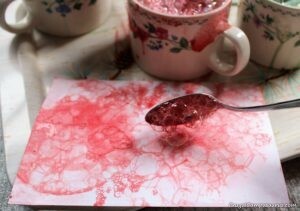 They will dry, pop and leave an imprint. 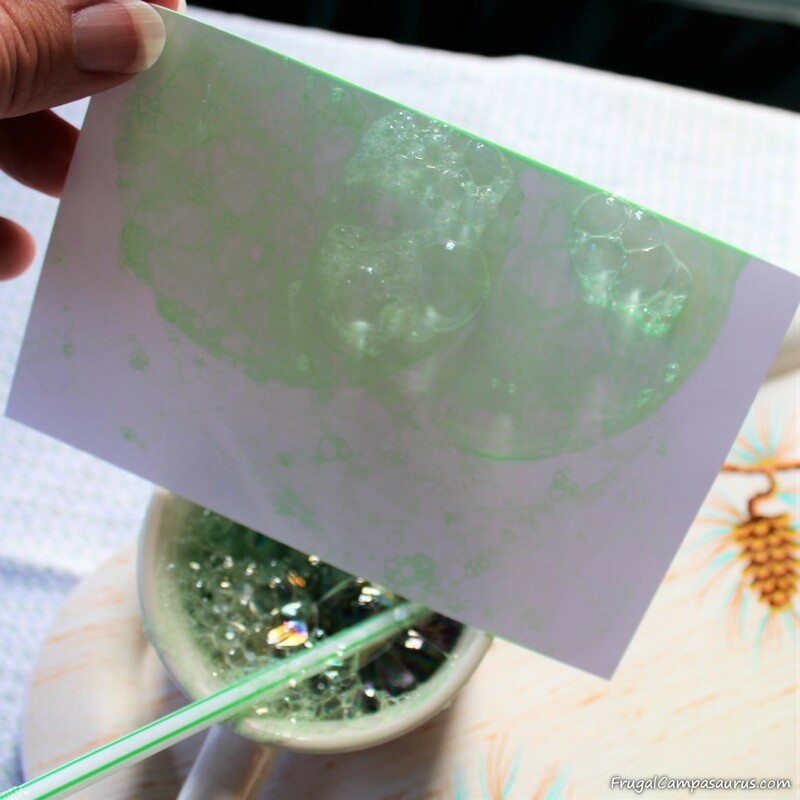 For small projects, it is easy to lay the paper onto the cup and make the bubbles. They pop against the paper and leave a print. 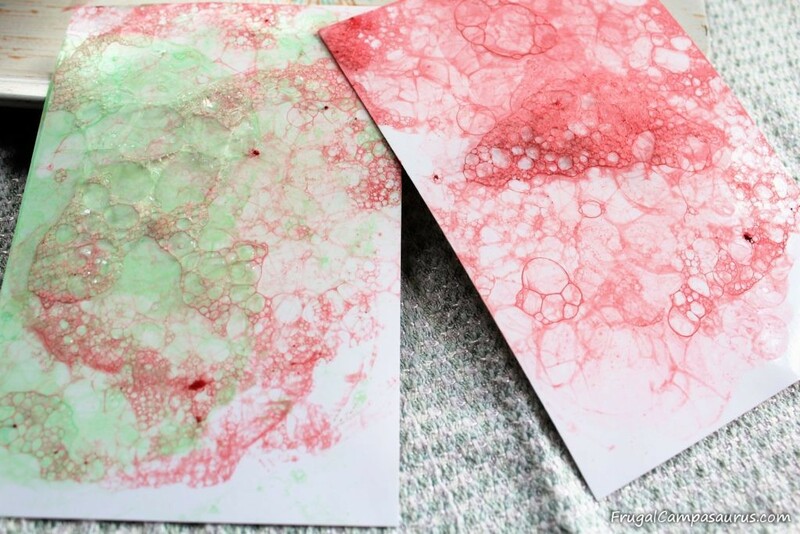 It does not work to try and wipe the bubbles off, it just smears the paint. They need to pop and dry on their own. 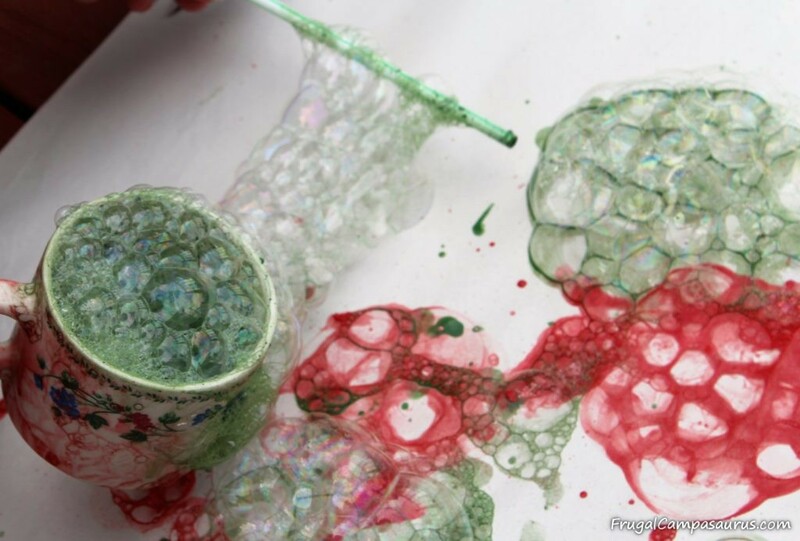 It is fun to get a large tower of bubbles and then spoon them onto the paper. 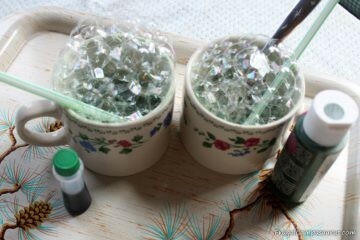 For the wrapping paper, it did not work to set the cup onto the paper and make lots of bubbles. That just made a puddle of paint; oh well, it can be the bottom of the present. It did work great to make a tower of bubbles and swipe them off the cup and onto the wrapping paper with the straw or a spoon. 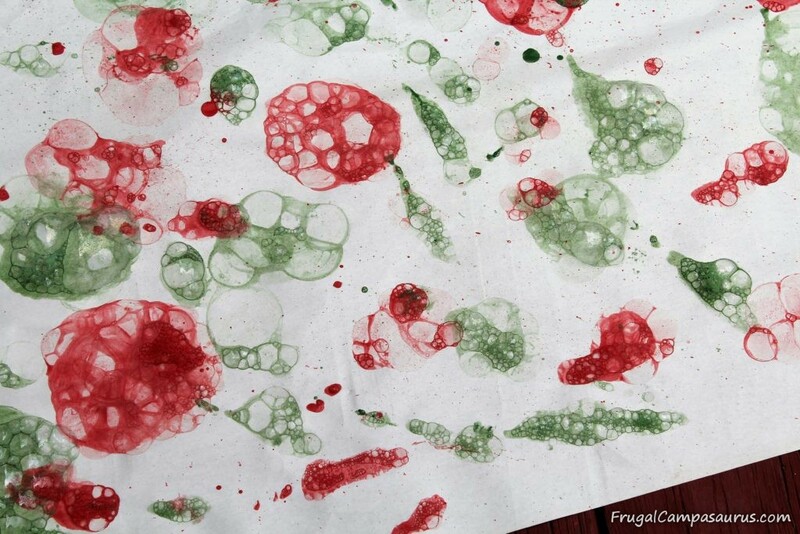 While the kids were not interested in Christmas Bubble prints, or making wrapping paper, they did like the neat designs that the bubbles made. It was a fun morning, working on an early Christmas project. 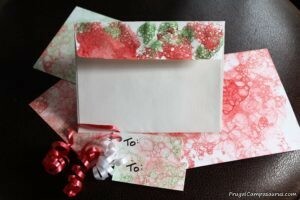 I’m so excited to have the paper done, I can’t wait to cut the gift tags, punch a hole in each one and add the ribbon. I could have a whole box done and ready for Christmas- and it is not even the end of summer yet! Hopefully, this Finish it Friday inspires you (and me) to work on more early Christmas projects! Happy Camping (or blowing pretty, colorful bubbles)! Previous Post:An Easy Camping Pie Iron Meal from Planned Leftovers!